NASA's Parker Solar Probe will begin its journey to the sun in the early hours of Aug. 11. Here, an artist's rendering shows the spacecraft soon after launch and separation from its Delta IV Heavy rocket. 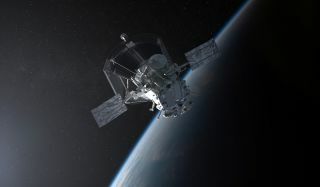 CAPE CANAVERAL, Fla. — This weekend, on Saturday (Aug. 11), NASA's Parker Solar Probe will boldly go where no spacecraft has dared go before: up close and personal with the sun. At 3:33 a.m. EDT (0733 GMT), the spacecraft will leave Earth and begin its journey, with its destination hidden and the sky dark, hitching a ride to space atop a United Launch Alliance Delta IV Heavy rocket. Once separated from its orbital taxi, the Parker Solar Probe will race toward our home star, eventually swooping within 3.8 million miles (6 million kilometers) of its fiery surface. It carries with it four science instruments that will collect a plethora of data about the sun's searing outer atmosphere, known as the corona. Tomorrow's launch will lift off sometime during a planned 65-minute launch window, which opens at that early morning hour in Cape Canaveral, Florida. Baez explained that originally, the launch window covered a 2-hour period, but launch services narrowed the time to 65 minutes to help minimize the spacecraft's exposure to the Van Allen radiation belts — a collection of charged particles held in place by Earth's magnetic field — that surround the planet. The original two-hour slot was needed to reach the probe's first destination, Venus, but other concerns shrunk it down further. "We started this with a two-hour window," Baez said during the briefing. "As we looked at the trajectory, we realized that we are coming close to the Van Allen belts as we fly out, so we have a radiation concern on the launch vehicle." According to Baez, this is why the launch window cuts off at 65 minutes. These belts can grow and shrink in response to incoming energy from the sun and interactions with the solar wind, one of the key things that the Parker Solar Probe will be studying. The sun's influence is felt throughout the solar system. Its immense gravity is what keeps everything in place. Despite its powerful pull, it's actually really hard to fly toward it. "It takes 55 times more energy to go to the sun than it does to go to Mars," according to NASA. To compensate for that, the Parker Solar Probe is getting a big assist from the planet Venus. The plucky little spacecraft, about the size of a small car, will fly by Venus seven times over the course of the mission. Each planetary pass will help shape the probe's trajectory, eventually placing it in a planned elliptical orbit around the sun. If the launch occurs as planned on Aug. 11, the first flyby will happen just over a month later, on Sept. 28. To hit that crucial mark, the craft will need to follow a specific path that potentially puts it in danger of crossing into the belts. Since the probe is packing some sensitive instruments, scientists would love to minimize the amount of radiation that blasts the probe before it arrives at the sun. According to launch officials, the predawn launch time will not only help the Parker Solar Probe meet its planned date with Venus, but the smaller window will minimize radiation exposure in the process. If all goes as planned, the $1.5 billion mission will survive its seven years in the sun thanks to a revolutionary heat shield that was designed especially for this mission. During that time, the probe will beam back data that should revolutionize our understanding of our nearest star. Editor's note: NASA's Parker Solar Probe will launch Saturday, Aug. 11, at 3:33 a.m. EDT (0733 GMT). You can watch the launch live here on Space.com beginning at 3 a.m. EDT (0700 GMT), courtesy of NASA TV. Visit Space.com Saturday for complete coverage of NASA's Parker Solar Probe launch.